Happy Knowledge Day! I’d like to congratulate the new students in attendance on getting accepted to one of the world's best universities – and I stand by these words. This is a special year in the history of MGIMO. This October, we will celebrate its 70th anniversary. The Second International Forum of MGIMO Alumni will also take place in October. MGIMO approaches its anniversary at the height of its success and in great shape thanks to the creative approach of the university administration, faculty and professors, and the inquisitive and hungry minds of the students. The university has established itself as a leader in training high-calibre specialists in international affairs and as a leading think tank providing wide-ranging analysis. In conjunction with the Diplomatic Academy, MGIMO provides a valuable product that aids the work of the Foreign Ministry. I believe that this class of first-year students has every reason to be proud of becoming members of this family – the MGIMO fraternity – and to start preparing themselves for an eventful and exciting career in government service, journalism, business and, of course, diplomacy, because MGIMO remains the main source of employees for the Foreign Ministry. We are interested in hiring talented young people. I hope that the Young Diplomats Council will assist us in arranging regular meetings so that you can learn first-hand about their work and life, and how they enjoy working at the Foreign Ministry. I’ll just answer for them now – they love it. If you hear anything different, don’t believe it. With the rise of globalisation and new means of communication, some predicted that diplomacy would eventually lose relevance, as it would no longer be necessary for diplomats to meet in person, share confidences and reach agreements. I believe it’s clear to everyone now that such claims, just like predictions about the end of history, were mistaken. International relations are becoming increasingly complex, and the need for diplomacy is on the rise – not just because this profession goes beyond purely political relations between nations to affect almost all spheres of human life, including the environment, the economy, the social sphere, climate change and more, but also – and perhaps most importantly – because nothing can take the place of old-fashioned human interaction. You can have a million phone conversations, send messages on WhatsApp or talk on Skype, but nothing can replace face-to-face interaction. This is true in personal life and in diplomacy. Speaking at a meeting of ambassadors and Russia’s permanent representatives abroad, held at the Foreign Ministry on 1 July, President Putin noted the ever increasing workload of the Foreign Ministry and our embassies resulting from the fast-moving international situation, sometimes unpredictable international developments, the aggravation of old global conflicts and the emergence of new ones. This aptly describes the current state of the world and the environment in which we operate. The unipolar model has failed, as almost everyone now agrees. Nations are committed to charting their own future and choosing the development model that suits their traditions and their cultural and civilisational identities. These are objective facts. The world is becoming more globalised, diverse and varied, with new economic growth centres appearing on the map, such as China, India, and Brazil. Economic growth translates into financial and political clout. Failure to recognise the new engines of the global economy, especially in the Asia-Pacific Region, is tantamount to standing in the way of history. Unfortunately, this reality hasn’t sunk in yet. Our American partners and their close allies are trying to reverse this undeniable trend, or at least slow it down. We are urged to leave behind the logic of seeking spheres of influence in Europe and other parts of the world. We have never disagreed on that point. We have always advocated abandoning spheres of influence in global politics. Unfortunately, our American partners urge everyone to abandon their spheres of influence while reserving their right to expand their own geopolitical space. That’s a fact. Whenever the United States sets out to do something, it is difficult to talk them out of it. But if we don’t discuss things openly but instead, as many do, just say “yes, sir” to whatever they are told to do, nothing good will come of it. We must discuss our disagreements with our partners. We hope that they will return the favour and refrain from indiscriminately accusing us of every deadly sin, and will instead sit down with us and give an honest accounting of their complaints. Unless this happens, we will be left to conclude that the criticism is an end in itself and serves only to justify ultimatums, sanctions, and the like. Our Western colleagues assure us that this is not what they have in mind, that they just want to influence the situation and to find mutually acceptable solutions to concrete problems, in particular, Ukraine. If so, let's sit down and talk, instead of threatening to impose sanctions or advancing totally unrealistic demands, such as insisting that the self-defence forces in Ukraine surrender their weapons and allow themselves to be destroyed – that’s what Poroshenko’s “peace plan” offers. Sensible voices, including in the West, are still able to see through the disinformation. The recent issue of Foreign Affairs (September-October 2014) featured an insightful article by Professor John Mearsheimer of the University of Chicago, “Why the Ukraine Crisis Is the West's Fault”, in which he wrote that the United States and the European Union now face a choice: either ratchet up the pressure on Russia while continuing to destroy Ukraine, which would be a loss for all stakeholders, or “shift gears” and help build a prosperous and neutral Ukraine which will make a positive contribution to promoting cooperation between Russia and the West. Everyone wins in this outcome. I fully agree with this. But first, the real policy-makers have to heed these words of wisdom. We believe that, most importantly, Washington and Brussels should demand, as they invariably do in all other conflicts, that Kiev stop using heavy weapons and aircraft against civilian targets, urban areas and civilians, and stop destroying schools, hospitals, and kindergartens. In this situation, the self-defence forces have no other choice but to use force to drive the Ukrainian military out of positions where they can shell and kill women, children and seniors. As long as this simple truth is not recognised by everyone, the violence will continue. The Ukrainian troops must withdraw from the positions they use to inflict harm on civilians. I very much hope that the focus of today’s talks will be on agreeing on an immediate and unconditional ceasefire. Russia will do its best to promote a peaceful political solution in Ukraine that reflects the interests of all its regions and political forces, without exception. This is the kind of foreign policy we seek to advance. It is an independent policy, and while we will never cede our independence in matters of foreign policy, this should not be construed as isolationism. We conduct our foreign policy in strict compliance with our international obligations based on the principles of international law enshrined in the UN Charter and other core documents. We are strongly opposed to these principles being interpreted and applied selectively, such as we do like a certain principle, but ignore the right to self-determination even though it’s a fundamental value and a cornerstone of the UN Charter. We will consider all principles of international law that we have signed onto as an organic whole. We will seek concerted and collective action, because no one can solve problems alone. Action rooted in international law precludes double standards. Our CSTO, CIS, SCO, and BRIC allies, as well as the vast majority of other members of the international community, agree with us on this point. We are convinced that our relations with the European Union and the United States can and must be put back on the path of pragmatic cooperation based on equality and mutual respect. To do so, the fruitless policy of threats, ultimatums and sanctions must end. As we set ourselves the ambitious task of integrating into the Asia-Pacific Region and promoting socio-economic and technological progress in the Far East and Eastern Siberia, we continuously emphasise that this is meant to complement rather than replace our policy of promoting partnership with Europe and the West in general. It will be a great pity if Western countries opt for a policy that turns our move toward the East into a replacement for deeper partnership with Europe and other Western partners. This is not our choice. I don’t know why we are being pushed in this direction. Yesterday’s decisions of the European Council show that the sanctions inertia is still very strong. President Vladimir Putin’s strategic initiative to create common space of economic and humanitarian cooperation and security from Lisbon to Vladivostok remains on the table. It would get rid of a lot of issues related to the confrontation between different parts of Europe and Eurasia and NATO’s provocative policy of perpetual expansion and placing military infrastructure next to the Russian borders. In a common space of equal and indivisible security, every country would feel at ease, whether a member of NATO or CSTO, or a neutral country that is not part of any bloc, like Ukraine and Moldova in accordance with their laws. Every country could feel safe in such a space regardless of whether they belong to a military-political bloc or some other association, or are neutral and stay out of alliances. In this case it would be much easier to resolve many of the problems that sometimes lead to bloody clashes. This should be unthinkable in the Europe of the 21st century, but regrettably it is still happening. NATO should give up its attempts to retain privileges for its members. The claim that security can only be legally guaranteed within NATO and that non-members subject themselves to all sorts of trials and risks rests on outdated logic. Unfortunately, our partners are still unable to move beyond it. We are urging them to give up Cold War stereotypes and take a realistic and honest view of things, to show political will and stop talking in accusatory slogans. We need to sit down at the negotiating table and start working toward an agreement and seeking a balance of interests. Otherwise, we won’t find a stable solution to any issue. Question: What solution to the crisis does Russia envision in view of recent events in Ukraine? What is the likelihood that Russia will intervene militarily in the conflict? Sergey Lavrov: There will be no military intervention. We favour an exclusively peaceful solution to this grievous conflict, this tragedy. Everything we are doing is aimed at promoting exclusively political approaches. To our deep regret, our Western colleagues seem to be blind to reality. Their approach is biased and politically motivated, and they uncritically support absolutely everything that the current Kiev authorities do. I’ve repeatedly cited a good example of this. We did not imagine the agreement signed with then President Viktor Yanukovych by Oleh Tyahnibok, Arseniy Yatsenyuk and Vitali Klitschko, as well as the German, French and Polish foreign ministers. It was signed on 21 February of this year. At that time everyone welcomed the agreement because it opened the door to steering the confrontation on Maidan Square toward a political process and negotiations. The first provision of the agreement was “the immediate formation of a national unity government” at the insistence of our West European partners. When EU members meet and adopt declarations on the Ukrainian crisis now, they no longer mention this goal. They don’t mention the agreement at all, even though it was signed at their initiative and they actively promoted it. All these signals were received. Okay, let the West forget about its agreements, but what about national unity? How can a government of national unity be the goal in some places and not others? Seeking national reconciliation and unity must be the ultimate priority in any crisis. The second attempt was made last April. The foreign ministers of Russia, the United States, the European Union and Ukraine signed a declaration calling on Ukraine to immediately start an open and accountable process of constitutional reform involving all regions and political forces. When we ask the Europeans and Americans why the word “immediately” has been forgotten since April, we get no answer. Yesterday, the European Council again adopted decisions on Ukraine which applaud Poroshenko’s “peace plan” but do not even mention the signed agreements that reflect a collective rather than unilateral approach to helping the Ukrainian people out of this predicament. I hope the Europeans will start to feel ashamed about what is happening. Some European politicians have started saying that the obsession with sanctions is fruitless and absolutely counterproductive. But it seems that the EU is either unwilling or unable to influence belligerent Kiev – to stop Kiev and force it to honour its agreements. To conceal the awkwardness of this situation, the EU is again resorting to sanctions. I’m convinced that many serious European leaders realise that this is a vicious circle, but apparently they cannot afford to admit it because that would acknowledge the failure of their thoughtless and reckless support for Kiev’s bellicose actions against its own people. This is the root of the problem. Question: Could you please discuss cooperation among BRICS in the summit format? Sergey Lavrov: Cooperation among BRICS takes place both within the framework of summits and in more than two dozen other formats. There are sectoral dialogues like meetings of foreign, health and agriculture ministers, and other dialogues. There are regular meetings of political analysts. A statistical digest is published, whose contents will be expanded. In short, this is a multi-faceted cooperation mechanism. The decisions to establish the BRICS Development Bank and a reserve currency pool, which were made at the past summit in Fortaleza, Brazil, in July, took our cooperation to a higher level, the level of practical efforts in the financial sphere. This is very important in terms of helping the BRICS states to protect themselves, not just from ordinary tremors in the sphere of international finance, but also from attempts by those who rule the international financial system to abuse their influence to achieve political goals. Everyone knows that the Americans do this, but the BRICS countries reject this approach. Declarations adopted at the two previous summits call for avoiding any illegal coercive measures in the trade and economic sphere. This is a direct response to the policy of circumventing the UN Security Council and imposing illegal sanctions. In my opinion, BRICS is a powerful and promising alliance accounting for more than 45 percent of the global population and for nearly 30 percent and counting of global GDP. Another important aspect of BRICS is its role as one of the two most influential players in the G20 – a forum that coordinates and forges common principles for the future functioning of the global economy and global finance, including the work of the IMF and World Bank. Among the 20 nations in the G20, the five BRICS members are a magnet to the not insignificant number of countries that feel the same – important countries like Indonesia, Mexico and Argentina are gravitating towards the common position of BRICS in support of fair reforms in the international financial and currency system, which would reflect real changes in the balance of power. In the political sphere and elsewhere, the West has been standing in the way in an effort to maintain its dominance in the distribution of quotas and voting power in the IMF and World Bank, even though the United States and Western Europe hold a disproportionate number of votes relative to their real economic weight. In 2010, the G20 summit in Seoul agreed the first phase of IMF quota and voting reform, but four years later, the US and the EU continue to thwart the implementation of the consensus decisions they helped pass. BRICS has spearheaded a campaign to make international financial and economic relations more democratic. Question: How would Russia respond to new economic sanctions? Would it consider withdrawing from the WTO? Sergey Lavrov: I won’t speculate on how we might respond to a new wave of anti-Russian sanctions – everything should be precisely calculated. When we learn what our European and American colleagues are up to, we will consider how to respond. It won’t be about “slamming the door” or any other misconstrued affronts. We will proceed from our own interests – protecting our economy and social sphere, our citizens and our businesses, while simultaneously drawing the proper conclusions from our partners’ actions and deciding whether they are open to negotiating and reliable. The steps being taken on sanctions make clear what our partners are seeking to achieve. If they say in chorus that, even though it will hurt them too, they must impose sanctions in order to punish Russia, this doesn’t seem appropriate. So, we need to decide whether to deal with these people in the future, and to consider what they are capable of. As for the WTO, on the contrary, we want to use its tools more actively, including in trade disputes. We have already employed them to end the EU’s discriminatory policy regarding anti-dumping procedures (they accuse us of dumping and take anti-dumping measures against many branches of our economy). We will make use of WTO mechanisms to defend our opposition to the retroactive application of the terms of the EU’s Third Energy Package, that is, agreements and projects that were begun and completed long before this energy package emerged. Some countries have initiated WTO proceedings against us. This is standard practice. We knew what to expect. Russia had to wait 18 years to join the WTO. They erected artificial barriers to keep us out. During that time, we learned all about the mechanisms and opportunities offered by the WTO. Russia is fully represented at the WTO in Geneva. We will keep mastering this art. In the end, it is useful and better than trade wars. Question: Russia was expelled from the G8, but can it restore its membership later? How much will depend on the Ukraine issue? 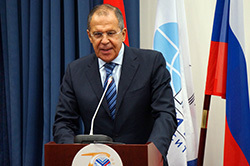 Sergey Lavrov: Again, we were not expelled from anywhere. Our partners just didn’t attend the summit, they skipped it. The G8 is not a body one can be expelled from. There are no procedural mechanisms – it is just a club for discussing issues of mutual interest. If there is no mutual interest, well, love cannot be forced. They just skipped an event, that’s all there is to it. I can’t say it was a deep loss. The G8 is an important club, but in the past years its importance was primarily a function of prestige: it is prestigious to sit next to the US President, heads of leading European nations, the German Chancellor, the Russian President. But the G8 summits were made popular by the accompanying outreach events, for which invitations were sent to African and Latin American countries, and representatives of other regions. You could meet with world leaders and solve some problems. As to the G8’s agenda, its significance was undermined by the founding of the G20 – that’s where all the financial and economic coordination has gone. The G8 tried to compensate for this change in multilateral diplomatic structures by immersing itself in political problems: the conflicts in Syria and on the Korean Peninsula, the Middle East peace process, Afghanistan, etc. Unfortunately, they showed inconsistency. For example, in 2013 the G8 Summit was held in Loch Erne, Northern Ireland. When the Summit’s declaration was being coordinated, British Prime Minister David Cameroon, as the host of the event, proposed adding a section on Syria in which the G8 leaders called on the Syrian government and the opposition to work together to drive the terrorists out of Syria. We actively supported this approach. We did so because we were and still are convinced that from the very start of the so-called Arab Spring, the core problem throughout the Middle East and North Africa has been to prevent terrorists from coming to power. However, the text approved by consensus at the G8 Summit, which incorporated the proposal of the British Prime Minister, failed last year at the UN Security Council because Great Britain and the US withheld support for some reason. This is a simple example of how a politically correct statement in the G8 communiqué holds no practical value. The authors of the statement – the British alongside the Americans and other Europeans – continued to snipe at Bashar Assad’s regime and foreswear any cooperation with it, and they continue to even now. Even though they agree that terrorism must be fought, they keep saying that as long as Assad is around, terrorists will flock to him like moths to a flame. But we’re not talking about harmless fireflies, we’re talking about terrorists from around the world who are intent on committing violence. Contrary to all conventions against terrorism, which state in black and white that terrorism cannot be justified, our Western friends are doing just that in Syria, arguing that no holds are barred against a bad regime. The Islamic State group, formerly known as used the Islamic State of Iraq and Levant, was born in Syria due in large part to the fact that the West and some countries in the region were secretly, without advertising it, providing political and material support to opponents of the Assad regime. That support probably helped create the terrorist group ISIL which promises to be much worse than Al Qaeda. Everyone turned a blind eye. We were warning that such lawlessness must be stopped, that it is time to recognise that not everyone opposing the regime is necessarily good. There is no such thing as good terrorists. No one answered our calls for greater cooperation. It was only when the terrorist group crossed into Iraq, capturing a third of the country, that our partners took alarm and started striking the terrorists’ positions and helping the Iraqi government (we have been assisting the government and cooperating militarily for a long time). But they still keep on saying, “We’ll bomb them in Iraq but we shouldn’t in Syria, because the terrorists might help topple the Assad’s regime there.” How can we make deals with such people? Supporting some dictators but not others is utterly inconsistent and opportunistic. They wanted to overthrow Gaddafi, and what did they achieve in Libya? The country no longer exists. Iraq is falling to pieces. Coming back to your question, I would like to note that the G20 plays the leading role on economic and financial issues, and nothing can take its place. We feel we can operate much more effectively in that association through BRICS, since we stand for the same approaches. As to the G8’s political agenda, if our partners had been consistent, it could have used its political influence. But it’s no tragedy that the G8 members didn’t attend the summit, because the real decisions on international problems of war and peace, as opposed to slogans and declarations, are taken by the UN Security Council. Question: Could you comment on the situation in Syria and Iraq? What can Russia offer to stabilise the situation in these countries? Sergey Lavrov: I’ve already touched on this issue briefly. We shouldn’t try to invent anything new here. In Syria, just as in Ukraine, agreements that have been reached should be observed. There is a document dated June 2012, which is known as the Geneva Communique, to which we actively contributed. It was signed by the United States, the European Union, China, Russia, the Arab League, Turkey and the United Nations. This document outlines in detail the sequence of steps towards the resolution of the Syrian crisis and in particular the establishment of a transitional period, during which the parties should have reached an agreement on issues of constitutional reform, general elections, and the governing structures that would ensure national reconciliation. I am saying that these steps should have been agreed because this document is being ignored for over two years now. Immediately following the signing of the Geneva Communique in June 2012, just as with the agreements on Ukraine, we wanted it to be endorsed by the UN Security Council, which would have created a roadmap for the resolution of the Syrian crisis. However, Western nations flatly refused, saying that they wouldn’t endorse the Communique until we include an additional point requiring Bashar al-Assad to resign despite the fact that he had approved the document. We asked them: “How is that possible? There is nothing of that kind in the document and this issue was never discussed. According to the document, the Syrian parties were to begin talks and, based on the mutual agreement of the government and the opposition, to form interim structures.” But they kept insisting that Bashar al-Assad should resign. As a result, the agreement fell through. In 2013, when the issue of the Syrian chemical weapons disarmament was discussed, and the UN Security Council approved the plan to destroy Syria’s chemical weapons, only then, a year after the Geneva Communique had been signed, was it endorsed. So, just when you think that you’ve reached an agreement, the West is trying to backtrack on it. It was agreed by consensus that provisional structures had to be formed. And then we hear: “Consensus is good, but Bashar al-Assad has to leave.” They always try to pocket something and then they say: “What’s mine is mine and now let’s discuss yours.” I understand the desire, but they shouldn’t stoop to outright cheating on their partners and should work honestly. As I said earlier, the crisis has now moved to Iraq and Libya, although it had never ended there, of course. There can be no double standards. Just because you want to topple an authoritarian leader, and Muammar Gaddafi was indeed an authoritarian leader, you should not put everything on the line just for the sake of your personal project to get rid of him. We were told: “Once Gaddafi is gone, the Libyan people will be able to breathe freely and democracy will come to Libya.” These weren’t just unofficial statements. They were made publicly by the leaders of major powers. And where is Libya now? Terrorist groups have captured a huge number of oil fields. They sell this oil and Europe buys it because the ban on importing Libyan oil has been quietly lifted. The proceeds from oil exports finance terrorists while Iraq is trying to fight them. As a result, we get a vicious circle. Once Gaddafi was gone and it turned out that the people they were arming and financing destroyed the country, taking under control various regions, and moved on out of boredom to overthrow the government in Mali, the French, who openly and actively supported and armed the Libyan rebels, confronted them in Mali – the very same force they had created to topple Gaddafi in Libya. When I mentioned this to my French colleague, he laughed and said “c’est la vie.” This is hardly the way to conduct politics. If I like a certain leader, I’ll turn a blind eye to all his wrongdoings, but if I dislike someone, we’ll do whatever it takes to topple him, despite the fact the country has the highest standards of social security. This is not the way to conduct politics. It’s impossible to fight the ISIL in Iraq, declaring it a key goal, and at the same time to turn a blind eye to these international terrorist in Syria, hoping that they will overthrow the Syrian government. If we want to cooperate honestly and achieve our goals through collective efforts, as it’s impossible to achieve anything acting alone, then we need to agree on certain general rules. Fighting terrorism should be at the core of all our efforts in the Middle East. Question: What should be the focus of the international community ahead of the 100th anniversary of the start of WWI? Sergey Lavrov: President Vladimir Putin spoke about this in detail at the Seliger 2014 youth forum. Russia was dragged into WWI against its will, and not only did we lose, through no fault of our own, we actually lost to loser. Of course, all the promises made to lure Russia into the war went unfulfilled. And the unjust end to the war set the stage for WWII, which followed soon after, beginning less than 20 years later. At that time, honest historians wrote that Russia saved Europe in WWI at the enormous cost of millions of its citizens’ lives, just like it had the wars started 100 years prior by Napoleon Bonaparte. In WWII, Russia again helped defend Europe against itself. Hitler, like Napoleon before him, wanted to conquer Europe. The conclusion is clear – military force is not a good bet, and this is even truer in the 21st century. I hope we all step back from the dangerous line we’ve approached over the internal crisis in Ukraine, and that the Ukrainian authorities will realise that the policy of crushing its own people at any costs, including the lives of its citizens, and destroying the social and economic infrastructure is bound to fail. Another important conclusion is that Europe always has to seek solutions that fully involve Russia and respect its interests. We are ready to do our part. Russia is a European country that has made an immense contribution to Europe’s history, arts, culture and science. The efforts to side-line us and the incoherent arguments brought against our numerous proposals to create a single economic and cultural space from the Atlantic to the Pacific will not work. I think that the Ukrainian crisis has to show everyone the disastrousness of policies that confront any country, particularly a nearby and close like Ukraine, with a false choice: “Either join us or join Russia, but if you join Russia we will again draw dividing lines and build walls between us.” This either/or choice that Brussels sometimes imposes on Ukraine and other countries in the post-Soviet space only serves to provoke. I would say it is worse than criminal, it is a huge blunder. Question: With respect to the situation in Ukraine and recent US statements, there has been a lot of ridicule on the Internet directed at Russia’s foreign colleagues, including US Department of State spokesperson Jen Psaki, mocking some of their absurd and even comical statements. Are our colleagues really that ridiculous, or do they just want us to think so? Sergey Lavrov: That’s for you to judge. It comes down to each person’s sense of humour and ability to take a joke – or lack thereof. It depends on the individual. As an official, I would not use that language. I describe what we hear at the press briefings by the US Department of State and the White House in terms of an absence of facts and the weakness of their arguments. We never refuse dialogue, and we are ready to discuss our divergent views, but they never present facts, they ask to be taken at their word… We’re more serious than that at least. Yesterday, the European Council again released a document demanding access to the MH17 crash site. Where have they been all this time? Why have they withdrawn the Dutch and other experts from the site? There was no danger from members of the self-defence forces. The UN Security Council called for a ceasefire around the crash site. The same day the UNSC adopted a binding resolution, and Kiev announced it would observe a ceasefire after it took control of the crash site. But they didn’t stop shooting for ten days. Were they reprimanded for that? Not at all. They were given cover. Then everyone forgot about the plane crash. Dutch experts arrived at the site and then they left. We have not been able to obtain any information or even a draft report. The flight recorder data have been decoded but have not been made available to the public, nor has there been any information on exchanges between Ukrainian air traffic controllers and aircraft crews on that day, including the MH17 crew. Why is everything being concealed? It makes no sense to us how statements claiming the aircraft was downed by members of the self-defence forces with the help of Russia are not backed up by satellite images but with images from YouTube. It’s suspect. I think the investigators have to be sent back to the site. Why is no one examining the debris there? The debris is shown in Russian news reports, which means it can be approached and filmed. Why have the experts who can ascertain the truth left the site? I would assume that experts are able to tell what type of weapon was used against the aircraft by the nature of holes in the hull, wings and the cockpit. Skilful oratory is less convincing than facts. We have presented our factual conclusions, but there has not been any response. We have asked over 20 questions that anyone with a minimal professional background would ask. We are waiting for answers. Question: In your remarks, you repeatedly mentioned the Ukrainian crisis. Given the current international tensions over the conflict, how could you describe prospects for relations between Russia and EU countries in the next few years? Sergey Lavrov: I hope we won’t be forced to end cooperation with our European partners. As I have said, we are seeking to expand relations with the Asia-Pacific region, but this is meant to compliment rather than replace a deeper economic, trade, cultural, technological and comprehensive partnership with the EU. We don’t want the Europeans to undermine important areas of our cooperation for the sake of their dubious policy of total support for the Ukrainian authorities. I hope that an awareness that this policy leads nowhere is growing in the EU, and that common sense will ultimately prevail. We would welcome this, but naturally the foundation has to be equality, mutual respect, and balance among the interests of all participating countries. Question (retranslated from English): I have two questions for you. What approaches do you find advisable to the settlement of the Palestinian-Israeli conflict? And would you mind taking a selfie with me after this meeting? Sergey Lavrov: As for the selfie, sure, let’s do it. With regard to the Palestinian-Israeli conflict, it is one of the longest-standing among all global problems. Attempts were made to push it into the background and play down its importance with the outbreak of the Arab Spring. That was a mistake. At any rate, the main – even if interim – result of the Arab Spring, however alarming this might be, is the sharp escalation in terrorist activity as terrorist gangs receive considerable funds, particularly from drug trafficking. The anti-government forces in Afghanistan and Iraq – the Taliban, al-Qaeda and now the Islamic State of Iraq and the Levant (ISIL) – have been receiving excellent weapons for decades, and for some reason nobody has questioned where their arsenals come from. As for who arms the opposition and how, the problem is reduced to questions addressed to Russia: where do the Ukrainian self-defence forces get their arms? Meanwhile, numerous instances are known, particularly from operation reports, of armoured vehicles seized from surrounded government troops. There is also an ideological aspect to the problem apart from the financial and material ones: Middle Eastern terrorist gangs are not just receiving everything they need for their dirty work but are also recruiting more and more militants. I think experts are right when they see the Palestinian-Israeli conflict smouldering for more than 65 years as the main reason why young people fall under the radicals’ influence. Big bearded guys indoctrinate children from early age with their own version of history: the Palestinian nation was promised a state of its own but the Jews got their state while the Palestinians got nothing because the West and Israel are evil. No wonder, when those kids reach the age of 15 or 16 years they are completely brainwashed and ready for anything. So it is critically important to settle the conflict not only because Palestinian Arabs must receive what they were promised despite the mistakes made by both sides. Today is not the time to dwell on all the missed chances, and the mistake of the late Yasser Arafat, who did not take what President Clinton was offering. All that would be empty talk. The Palestinian problem must be settled solely on the basis of the previous understandings (we have talked about it today with regard to Ukraine and Syria). There are many such understandings on the Palestinian-Israeli issue: the UN Security Council resolutions, the Madrid Principles and the Arab Peace Initiative, which was supported by all Muslim states in the Organisation of Islamic Cooperation (OIC), including Malaysia and Indonesia – the leading Asian Muslim countries. It envisages the recognition of Israel by all Muslim states in exchange for the establishment of a Palestinian state. This document came as a breakthrough, and we support it actively as no other initiative lays a more realistic basis for settlement. Now we have greeted the long-term armistice made on Egypt’s initiative – I hope it will not remain on paper. The edge has been taken off the situation in Gaza with checkpoints unblocked. However, we must not rest on our laurels, thinking that skirmishes have stopped and the siege eased off, somewhat. This is no time to relax. It’s vital to resume the talks on the establishment of the Palestinian state. President Mahmoud Abbas of the State of Palestine demands that the talks focus from the outset on the geography and size of the territories where the State of Palestine will be proclaimed. We find it a fair demand. The later agenda will deal with the status of Jerusalem, with refugees, etc., but it will be hard to carry on the talks if they do not start with the key item – the territorial parameters of the Palestinian state. Otherwise, the negotiations will create the impression of yet another talking shop, and it will be hard to keep the delegates at the negotiating table. We hope that Malaysia and other OIC countries remain committed to their policy, formalised in many summit documents and aimed at a just and mutually acceptable settlement of the Palestinian-Israeli conflict. Question: Earlier today you mentioned the idea of forming a single economic and humanitarian space from Lisbon to Vladivostok. What are the prospects for abolishing the visa restrictions between the countries in the Schengen zone and the Russian Federation? Sergey Lavrov: To be honest, the prospects are not very encouraging. Long before the Ukrainian crisis, the EU spawned a small but pushy group of countries opposing a visa-free regime with Russia exclusively for political motives. They did not hesitate to say that they had indeed formed expert groups that checked how the immigration, customs and border services operated, examined the biometric protection of passports and the state of other agencies that in some way or other catered to people’s movement, and made sure that there was an effective readmission agreement. They were fully satisfied. But this small group of countries, which had been blocking the signing of an agreement on visa-free travel, declared that politically they could not allow a visa-free arrangement with Russia to be introduced before its introduction with the Eastern Partnership countries – Moldova, Ukraine and Georgia – although at that moment the state of our neighbours’ readiness was not higher than ours. We have here a politicised approach based on double standards and the wish to spite us. This should be accepted with dignity and without panic, which is what we are doing. We have enough opportunities to ensure that our citizens travel to Europe comfortably. Many countries, including, for example, Italy and France, issue five-year multiple-entry Schengen visas, and I recommend using them. Many other countries, based on Schengen powers and the Russia-EU Agreement on Visa Facilitation, have taken meaningful steps making the visa application process minimally burdensome. I think procuring a visa once every five will not be too much trouble for anyone. Actually, it will cover the entire period of study. As for removing the obstacles on the way to signing a visa-free agreement (this would be psychologically important in itself), we continue to work on this. But you can see for yourself what the current climate is like: our EU partners simply refuse to see the obvious. Question: You said repeatedly that a policy of sanctions is irrelevant today. But what remedial actions can be relevant with regard to other countries? Sergey Lavrov: Persuasion. This is what we are doing. We must respond when unfair conditions are created for our business circles or when positions of our agricultural producers are undermined on the home market. The introduction of sanctions against the Russian Agricultural Bank (Rosselkhozbank) means that it will no longer have access to loans on favourable terms. At the same time, the subsidies and credits extended to European companies supplying food to the Russian market have not been affected in any way and they would thereby receive a competitive advantage. There must be a response to this in any event. But we don’t want to use the good old eye for an eye, tooth for a tooth principle. It’s not our approach. We constantly appeal to reason – without success so far; in all evidence, something is happening in Europe. The statements being voiced – that the Ukrainian authorities have the right to use force in their own country in order to suppress protests – are absolutely biased. So, Europe “is only urging the Ukrainian authorities to continue using proportionate force.” For them, what is happening in the Southeast is a proportionate use of force. In any other region (the Middle East, Gaza, Syria, African countries, South Sudan), in any conflict, Europe calls on local authorities not to use force against the civilian population – everywhere except Ukraine. We even asked them: “Is it because Russians and Russian speakers are being hit over there?” They reply: “Oh, no, don’t say that. It’s just that terrorists are fighting there.” What kind of terrorists are they? Europe welcomed the start of direct talks between Israel and HAMAS, which the European countries have proclaimed a terrorist organisation. But there are even tougher guys in the area, such as the Islamic Jihad, whose representatives were also sitting at the negotiating table. So, they can talk to those whom they regard as extremists and call other nasty names. Another case in point is Americans in Afghanistan. The Taliban and their leaders are on the UN Security Council’s terrorist list. But the Americans had no problem with that throughout their Afghan drama. They periodically came to terms with the Taliban and even tried to persuade them to start direct talks with President Hamid Karzai. He, in turn, was being persuaded to hold meetings and talks with the Taliban. They felt no scruples about that. But they do in Ukraine: “They are bad characters, we won’t talk to them.” It’s ugly and dishonest. We will promote fair approaches. I am sure that many people in the West (I quoted one clever person earlier today) understand that it is necessary to enforce an end to bloodshed and to immediately start coordinating the parameters that would enable Ukrainians to come to terms on how to strengthen their state, where everyone – Russians, Hungarians, Romanians and Ukrainians – will feel free. All ethnic and language minorities should feel involved in rather than hostile to the state.